morning lovelies! hope you had a great weekend! wow! thanks so much to the over 400 entries in the most recent rikrak giveaway! it's wonderful reading about your favourite goodies from all of the sponsor shops! many thanks! gosh! i'm a longtime fan of the ama zing Rosa e Chocolate's amazing arts & crafting. 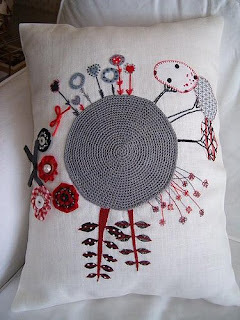 be sure to follow her gorgeous blog & amazing embroidery & other work on flickr. happy monday... and don't forget to enter the rikrak studio mchen handmade silkscreened tshirt giveaway, on now thru tuesday pm. click here to enter!